The weather wasn't the best but our stay was the best! Everyone is very helpful and very friendly! We love Capri by the Gulf! Thank you for sharing your review for Capri by the Gulf #126. We are happy to hear that you all had a wonderful stay with us! We appreciate having you all as our guests and we look forward to seeing you all back again soon here on the beautiful beaches of the Emerald Coast! Nice, clean cimfortable well maintained property right on the beach. Ocean just steps away, close to tons of stuff to do. Private beach with 2 chairs and umbrella was not cowshed and very family friendly. This was our 2nd year in a row to stay at the Capri. The staff was so nice and friendly. We love being so close to the beach. Room 126 was very nice and worked for us. We look forward to another trip and stay with Harmony Beach Vacations! I loved my vacation rental experience with Capri! I will be returning soon! Thank you for sharing your review of Capri by the Gulf #126. We are delighted to know that you had such a wonderful beach vacation stay in this beautiful beach condo! We look forward to welcoming you back soon as our guest for another beach vacation stay here at the Capri in Destin! It was great , I love this cozy little place. Its simply but has everything you need and not crowded at all. Please never change it. Thank you for sharing your review for Capri by the Gulf #126. We are so pleased to hear that you had a great stay with us and that you so enjoy the Capri! We completely agree, the Capri in Destin is an excellent location and it's not being crowded is such a perk! We hope to welcome you back again very soon to the place that you love here at the beach in Destin! We Love it here and will return as often as we are able! Thank you for your review of Capri by the Gulf #126. We are so pleased to know that you all love the Capri so much and we're happy to know that we'll be seeing you all here again often! This is the second time we have stayed in this unit. It is perfect. Quiet gated area with private beach is priceless. Thank you for sharing your review for Capri by the Gulf #126. We are delighted to know that you all had such an excellent vacation stay with us here at the Beach in Destin, and we hope to welcome you back again soon for another perfect vacation stay! We had a wonderful stay in the city of Destin. Harmony is a friendly, family oriented place. The location is really close to everything we wanted to do. Also the book with all of the favored places to go took the leg work out of where to eat and visit. I also liked the app with my questions answered right at my fingertips. Thank you for sharing your review for Capri by the Gulf #126. We are so happy that you all had a wonderful Family Reunion Beach vacation! We appreciate your compliments for our team as well and we're so pleased that we were able to offer helpful service to you all via the app and information book. We are glad to hear that you all enjoy the area so much, as we do too! We hope to welcome you all back soon for another wonderful beach vacation stay with us here in beautiful Destin, FL! As a family we have been coming for a decade now and it feels like a second home to us. Looking forward to coming back next year! Thank you for sharing your review for Capri by the Gulf #126. We enjoy having you and your family as our guests at the Capri and we look forward to having you all back soon to your home away from home here in beautiful Destin Florida! Thank you for sharing your review for Capri by the Gulf #126. We are so happy to know that you love the Capri as do we! We look forward to having you all back as our guests for many future fun times here at Capri by the Gulf! The unit was absolutely spotless. It could stand to be updated but that didn't matter much because the unit was so clean and everything worked. Thank you for sharing your review and suggestion. We are so pleased to hear that you had a great vacation stay and we hope to welcome you back soon for another wonderful beach vacation! Capri by the Gulf, managed by Harmony Beach Vacations, is a great place to stay for your vacation. 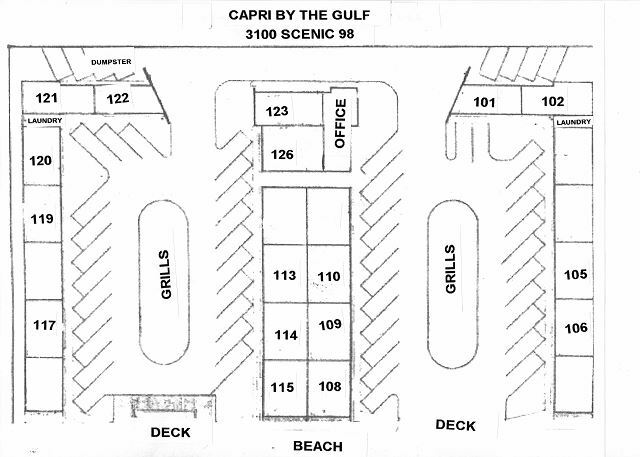 This gated location on the gulf within walking distance to shopping (two strip malls, Best Buy, Bass Pro etc.) and Restaurants is hard to find. Thank you for sharing your review of Capri by the Gulf #126. We are so pleased to have had you as our guest and so happy to know that you had a wonderful stay with us! Thank you for pointing out the conveniences of the area, we agree, this is a great location! We hope to be able to welcome you back real soon for another wonderful stay at the beach in Destin! Thank you for sharing your review. We are delighted to hear that you had a Fun time during your stay with us at Capri by the Gulf #126. We hope to welcome you back soon as our guest at the Capri in Beautiful Destin, FL! Thank you for sharing your review. We have so enjoyed having you as part of our Capri Family and we are happy to know that you all had another wonderful stay with us! We look forward to having you back real soon here at Capri by the Gulf! We booked this room for an extended Labor Day weekend and had an excellent time. We have stayed here before and loved it so much we decided to return and stay in this 2 bedroom unit. The beach is spectacular because you share it with only the other renters in this complex, so it is generally nice and quiet. The units are older, so if you are looking for 5 star accommodations, this place may not be for you. But if you are looking for a quiet, relaxing getaway, this is your place. Thank you for sharing your review for Capri by the Gulf #126. We appreciate having you all as our guests this Labor Day weekend and in the past. We are so pleased to hear that you all had another wonderful stay with us and we would be delighted to welcome you back again soon as our guests in Destin, FL! Very family friendly. Great staff. Perfect location. Private beach is priceless. Thank you for your kind review. We are happy to hear that you all enjoyed your vacation stay with us at Capri by the Gulf! We would love to have you all back soon as our guests at the Beach! Thank you for sharing your review. We are pleased to hear that you had a great stay with us at Capri by the Gulf! We welcome you back anytime as our guests in Destin,FL! We have stayed here for the last 4 years. Good location. Great property. Easy access to the beach. Only complaint is wished the a/c could be adjusted to have cooler temperature at night when sleeping. Other than that,it's a great place to stay. Will continue to stay there in years to come. Thank you for sharing your review. We appreciate having you as our guests over the years and we look forward to having you back as our guests at the Capri! We hope that you were able to speak with our onsite office about any a/c setting issues, we are always happy to help our guests so that guests can completely relax and enjoy their stay! We hope to see you back at the beach real soon! Great location! Very friendly and helpful staff. Little thinks like dish washing liquid and toilet paper should be included for the price. Thank you for sharing your review and suggestion. We are happy to know that you all enjoyed your May Bike Trip here at the Capri, and thank you for complimenting our staff! We would love to have you all back soon as our guests at the Beach at Capri by the Gulf! Our stay at the Capri was great. It's nice having beach right outside your door. Location was by everything you needed for your stay. We enjoyed other guest staying there and visiting with them. We also enjoyed Shea who made sure our beach chairs were ready for us each morning. Thank you for taking the time to share your review. We appreciate having you as our guests and we're delighted to hear that you enjoyed your stay with us at Capri by the Gulf #126! It's great to hear that you enjoyed the Beach Service and the beach being just steps from the condo, and we're happy to know that you enjoyed Shea taking care of you at the beach. We would be very happy to have you back soon as our guests at the Capri! We had a great time on your wonderful beach. The property was spotless which meant a lot to us. We felt safe and secure. Everyone was very kind and helpful. You were close to everything (restaurants...malls..etc.). You supplied everything we needed. Thank you. Thank you for sharing your review. We have been pleased to have you all as our guests over the years and we are so delighted that you all enjoy your stay with us at the Capri! We welcome you back anytime as our guests in Destin! This is our 2nd time to stay at the Capri & I can't say enough about the great location of this place! Wonderful little place with easy access to the beach. This unit was not as nice as the other unit we stayed in. Definitely think it's time for an update for this unit. We had to call maintenance a couple of times and they were quick to respond & very professional. Will definitely be back! Thank you for sharing your kind review and suggestions. We appreciate having you as our returning guests and we look forward to having you back soon as our guests in Destin! Marjorie my wife and Gerald (that's me) spent two weeks at the CAPRI and had a wonderful time.All condo are on ground level and the beach is 25 yards away.If you like to eat out there are several resturants within a couple of miles of the CAPRI.We have been coming to the CAPRI for several years and these are the most beautiful beaches in the world. Thank you for sharing your kind review. We appreciate having you as our guests over the years and we look forward to having you back many more times to your 'home away from home' at the Capri! We love this place so much we come back every year! It has become our home away from home. And we can't get back fast enough. Love love love it here! Thank you for sharing your review. We appreciate having you as our guests over the years and we look forward to having you many more times! Great spot near the beach! Capri by the Gulf is a great family place. It's not a 500 unit condo with a million people. The rooms are great, the private beach is sparse. There is no one above you. You open the door and the beach is down the steps. Gated with no busy streets to cross. My only complaint is that the condo was not as clean as the other times I had stayed. Maybe some bad cleaning people this time. Thank you for sharing your review. We appreciate you staying with us and are so pleased that you had a great vacation! We hope to have you back soon as our guests in Destin! We had a wonderful time on our vacation and the place was really nice..we really enjoyed being so close to the beach..the only problem we had with the place was the front bedroom was extremely hot..
Our Capri location was perfect. It was right on the beach with everything you could want surrounding it. The staff was very nice and helpful when we had questions. We are already making plans for our vacation with them next summer! Thank you for sharing your review. We are so pleased that you all enjoyed your stay with us and we look forward to having you return to the Capri! Stayed there with my grandma and granddaughter, we all loved it!! Thank you for sharing your review! We are so pleased that you all had a wonderful stay with us and we hope to soon have you back as our guests for more Happy Times! It was the best ever! We look forward to our stay there. We've never had any issues. Everyone is friendly and helpful. We had family in two different units and had a blast! This is my second time in this unit and plan to return. Convenient to everything! Thank you for sharing your review. We're thrilled that you all 'had a blast'! And we look forward to your next stay with us! The Capri is perfect for a family vacation! It is right on the beach, secure and all around terrific! We will definitely be booking again for next year! The beach itself is spectacular. you won't find cleaner beaches anywhere. We were even fortunate enough to see dolphins swimming past! Very happy. Can't beat this place for the price. Great location, very quiet. The beach chairs and umbrellas were a definite plus. Would like to return! We have enjoyed our many winters here and have made many lasting friendships. Because of the small property, it is very easy to meet people and enjoy the beautiful sunsets together. This unit is fine, with the exception of the couch which needs replacing and especially the pull out mattress which simply cannot be used in the condition it is in. Thank you for sharing your review. We're so glad you enjoyed your stay and we hope to have you back 'down on the Gulf' soon! Pros: Good price, gated, mostly clean, quiet, right on the beach, beach service included, friendly front desk staff. Cons: Bed sheet for fold out couch bed smelled dirty, dishes and silverware in kitchen were put away dirty, walked past unoccupied room where housekeeper was cleaning and yelling on a personal phone call, off duty staff members take over deck and grill area with their friends in the evenings sometimes. Okay overall, but could be better. Also could be worse! Not many places left in Destin where you can walk out of your door and right onto the beach! We have been staying at the Capri for 20+ years and this was the first time we stayed in this unit. As always it was an excellent experience.